Hollywood actor Kevin Spacey is one of the most iconic figures on-screen and stage and has appeared in a number of critically acclaimed movies. Spacey first began his career in the 1980s as a stage actor and eventually moved into film a decade later. The double Academy award winner has starred in such films as "The Usual Suspects" and "American Beauty". 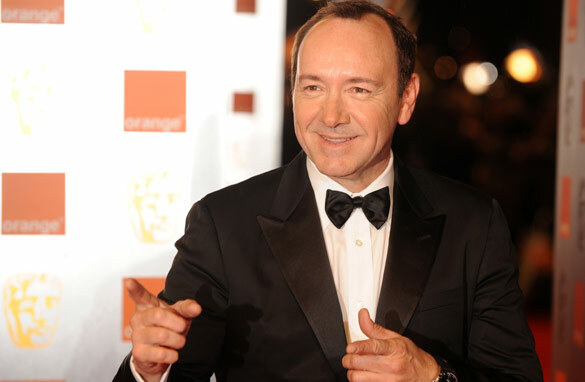 Since 2003, Spacey has also been the artistic director of the Old Vic theatre in London. Here's your chance to have your questions answered by this Hollywood actor. I strongly believe in unity through the arts. I am very interested in the theatre project you are involved with in the Middle East and the work you have done in China. Can you explain your motivations for these projects? In a recent interview with William H. Macey, he was asked if you have any advice for actors young and old who are new to Hollywood. His responce: Take Fountain. Do you agree? What play would you most like to be seen adapted to the big screen? Or, do you believe that a play cannot be given its due when translated to a movie? You probably are much too nice for it, but would you consider running for president? We need good people like you to make us feel good again about this country! From Florida. When will we see you in Inseparable? hello Mr Spacey. Do you think if we discount the graphics and special effecets in most movies these days, the movies on their own match up to the movies of the past when acting was the key ingredient? What did your role as artistic director of the Old Vic bring to you ? What is you assessment of the past eight years at the Old Vic ? What is for you the worst part about being a successful Hollywood actor? And the best? Are you ever too old to start and acting career? Do you believe today's postmodern society, which is schizophrenic in nature facilitates your taking on of new characters? do you remain unaffected by the transient nature of the various personages you incarnate, and finally do you believe this malleability of character and persona that is so inherent to the 21st century man can be made to work towards the bettering of society? Although you were in Superman, I get the feeling that you are not an actor who wants to appear in big budget comic book movies. What's your feeling on Hollywood making so many movies based on juvenille pulp entertainment rather than adult literature and classics? It can be tempting to imagine that very successful people lead charmed lives and that everything just falls into place, but, of course, that isn't true. How then, do you account for your success? Do you have a master plan for your life with particular milestone goals set out years in advance? When you encounter a set-back or disappointment – as we all inevitably do – what strategy do you apply in recovering from that? Hey Kevin, so, in the end of K-PAX, did you really leave or was he insane this entire time? What's your take on the movie? Hi!! Do you find any difference between the American and the London theatre? Dear Mr.Stacey,which writer you like the best? Hi im Francis, forgot to say where im from. (Perú) i wanted to ask Mr Spacey if he sees differences between American and Uk theatres and plays. Thanks! Kevin, could you tell about your project TRIGGER STREET .com? I won a prize for the best radio play to be written from Russia and the Caucasus in the BBC World Service & British Council International Radio Playwriting competition 2005. Now I'm thinking of uploading the play in the Plays section. In Russia it's very hard for emerging writers to have a play staged. Our directors and producers are dead sure all good playwrights have ceased long-long-long time ago. So they prefer classics like Chekhov. why is there very few plays from the westend ect. available on dvd, no matter how hard anyone may try theatre of this kind is not accessable to many, maybe because of cost or distance, thankyou sir.
" the usual suspect " and " American beauty " – why do you think this movies won the academy award in you personal opinion ? My question for Kevin: what is your favorite album and what music did you listen to while growing up? Mr Spacey, Your favorite author of the last decade? WhY? next time in Paris with LA Alex and Jerry will you let me know man I will show you the real Paris nightlife even if you come alone ? keep up your great work will you film in Paris soon? or how about doing Lonestar by JAMES MCCLURE as a play? I've been fortunate to see several of your performances at the OV over the last six years, and I look forward to seeing RIII in New York. You recently announced the creation of a Middle East theatre arts academy. Will tihs be similar to the OVNV program you've started in London? Thanks for your time and generosity! Vandal king Genseric dominated Europe during 50 years on V century AC. He was never defeated and died lord of all the territories he conquered along his life. A Spanish film director signed a contract to make a film about the life of Genseric, based in a novel written by Dario Varela, but he did not deliver on financial grounds. Would you consider making one or more film on this amazing king? Mr. Spacey, Love your work and am looking forward to Richard III. I understand you plan ahead, can you tell us what your plans are after your tenure at the Old Vic is up? I think you do the best Johnny Carson ever. What happened in your past that prompted you into developing that impression? Were you overwhelmed with prospect of becoming Artistic Director for the Old Vic, following in the footsteps of the likes of Lawrence Olivier? Thanks from Pat from Hamilton Ont. Canada. I have a question about K-Pax too. How many takes did you have to do for that banana-chomping scene? Were you really so upset when you visited Vienna last year to honor Maximilian Shell, or was it just *yucks and giggles*? If they ever shoot a movie about you, who would you like to see playing your role? You know how everyone has a twin. Someone in this world that looks just like them. Your twin lives in Sun Valley, Idaho and many years ago when I was a corporate Jet Pilot based in Houston, I dated him. We dated for about four months and I have to say, it was kind of fun dating "you"... Everyone was convinced... So, I say thank you for your celebrity, we enjoyed it immensely, in fact, "John" still probably does. Though, I think you have aged much better. I now live in the Virgin Islands and enjoy your films. We ski at Deer Valley every year and enjoy the Sundance experience. Your work is stimulating and wonderful, thanks so much for the entertainment! Mr Spacey, you are my favourite actor! Who are 5 people (living or dead) you would have around for dinner? Thank you. you haven't starred in a great film since American Beauty. Why is that? But your stage work has been brilliant as always. Loved you in National Anthems, will see you in Richard III. every time so cinvincing, I had no idea you were acting any of those scenes......you WERE your character.keep it up, you are the best!! What other countries in the world would you like to visit and why? I've been watching your films for years, and wondered especially how you achieve and sustain the necessary level of concentration to pull off a role like the one in American Beauty, and then how you unwind from gathering all that energy? In a few interviews, you've been asked to perform some of your impressions. How do you feel impressions factor into your work as an actor? Is it a by-product of the talent or an integral part of achieving the realism of acting? Mr Spacey, what say if you if you could help with the future of the American Dollar? Our performers in film, theater and the sports arena are often put on pedestals, and the lives we imagine they live are filled with spectacular moments, parties, expensive vacations and leisurely luxury. Reality rarely cooperates with fantasy – bills must be paid, health issues addressed, family squabbles settled, meals prepared & consumed, etc. – and it is hopefully within reality that we find our moments of happiness and contentment. So my question is this – in your daily life, amidst the mundane details and routines you share with nearly 7 billion other humans – what are some of your moments of happiness and contentment? A hot cup of tea loaded down with cream and a bit of sugar is one of the most looked forward to parts of my day, even if I'm sipping it while wading through a pile of bills... it's a dose of pure pleasure. In that mug I find a moment of bliss. Where or when or how do you find yours? How successful do you think TriggerStreet and 24-hour Plays at the Old Vic have been in "sending the elevator back down"? Any more plans in the works for helping out relatively young creatives in the field? And are you "done" with O'Neill? I'll be there for RIII at some point. Thanks to insightful statements you have given us in the past, I feel I have some appreciation for the difference between acting in a play and acting in a film. Since you have also directed both stage and film, can you give us some observations into the differences between directing a film and directing a play? Any plans to direct again in the future? Btw…..you were amazing in “Shrink.” That performance deserved to be seen by more in theaters. Hi Kevin, You have been lucky enough to travel to so many interesting places. What are some of the highlights of the places you have visited ? Please tell us more about The Kevin Spacey Foundation and how we can help. I had the opportunity of seeing you in Atlantic City when you did your Beyond The Sea concert tour. Any chance we'll ever have a concert tour again? An album? –	How is the the Old Vic theatre in London going to Improve our world? I am awaiting Kevin Spacey’s replies. Got milk? Seriously, milk does the body good. Is there any genre of film or type of character you've always wanted to play but haven't yet? Are you planning on having children someday? hi Kevin , love you name sound magical ..........Can you tell us the reason you won the academia award for American beauty and the Usual suspects ???? of course like your website but you need to take a look at the spelling on quite a few of your posts. A number of them are rife with spelling issues and I find it very bothersome to tell the truth on the other hand I will surely come again again.